Tuairisg Oifigiuil (Official Report) For Periods 16th August, 1921, to 26th August, 1921, and 28th February, 1922, to 8th June, 1922, with Index. Tuairisg Oifigiuil (Official Report) For Periods 16th August, 1921, to 26th August, 1921, and 28th February, 1922, to 8th June, 1922, with Index. 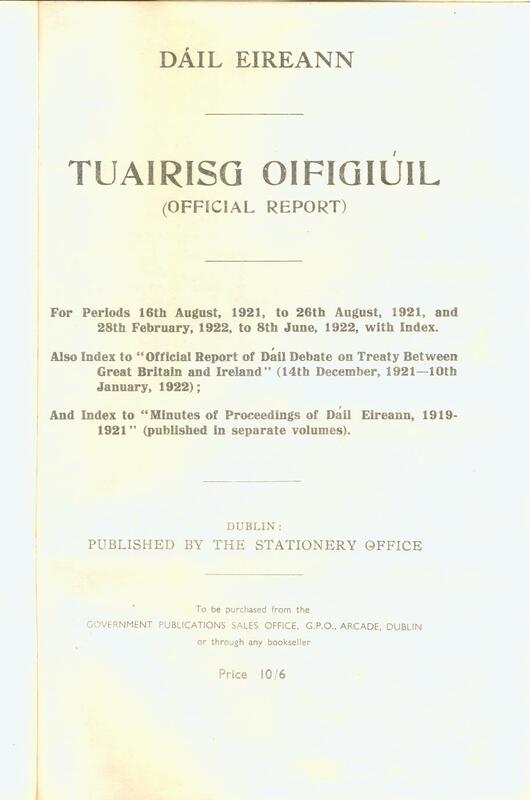 Also Index to 'Official Report of Dail Debate on Treaty Between Great Britain and Ireland' (14th December, 1921-10th January, 1922); And Index to 'Minutes of Proceedings of Dail Eireann, 1919-1921'.